U.S. Ambassador criticizes General Assembly's intention to condemn Israel. Danon: You're colluding with a terror organization. The UN General Assembly convened on Wednesday to vote on an anti-Israeli resolution initiated by Turkey and Algeria condemning Israel's actions on the Gaza border. U.S. 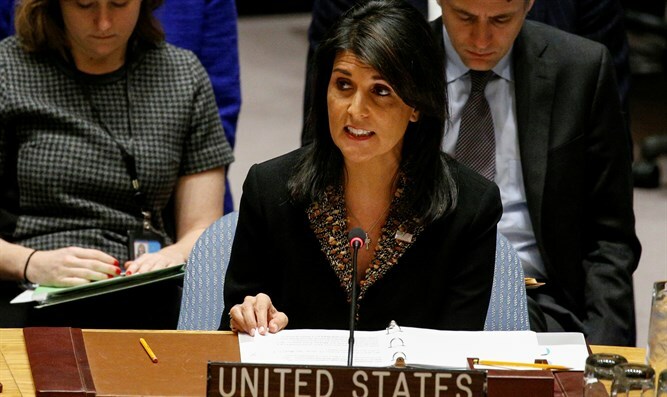 Ambassador to the UN, Nikki Haley, who presented a U.S. amendment to the resolution seeking to condemn Hamas for the violence on the Gaza border, spoke and condemned the General Assembly for continuing to single out Israel. “What makes Gaza different is that attacking Israel is their favorite political sport. The resolution is one sided, makes not one mention of Hamas which routinely initiates violence,” she said. “At what point will the UN hold Hamas accountable for what is happening in Gaza? It is Hamas and its allies who have fired more than 100 rockets into Israel in the last month. Hamas calls for the destruction of Israel in any borders. The resolution fails to mention Hamas. There is still chance for this body to right this wrong. The U.S. is offering an amendment that provides a small step in the direction of balance,” continued Haley. “It's a modest amendment that reflects the minimum truth of what is going in Gaza. It is the least that any self respecting nation can do. I urge my colleagues to support the U.S. amendment,” she said. Addressing the General Assembly after Haley, Israel’s Ambassador to the UN Danny Danon harshly criticized the countries supporting the resolution. “I am honored to stand here today. I am honored to stand to represent Israel at every UN forum, and in any UN hall. I am honored because I would rather speak in this room every single day in defense of my people, than give even one eulogy for an Israeli who would lose his life to Hamas terrorists if we let down our guard,” Ambassador Danon said in opening his address. “This session today is about our right to defend our people. It is the international community’s attempt to take away our basic right to self-defense,” Danon continued. “The resolution before you today does not protect innocent Palestinians. It does not protect innocent Israelis. It does not condemn, does not even mention, Hamas the internationally recognized terrorist organization directly responsible the violence in our region. By supporting this resolution, you are colluding with a terrorist organization. By supporting this resolution, you are empowering Hamas,” he noted.